Dominate the world with the new possibilities offered by this expansion for Sid Meier's Civilization: The Board Game. Personality cards represent historical characters, such as Marco Polo or Hannibal, providing significant help to civilizations. Investment cards allow players to spend hard-earned coins for lasting profits. Players can discover ancient relics, transform their capital into a metropolis, strengthen their cities with temporary fortifications or use caravans to improve productivity. This Glory and Fortune expansion offers new board tiles, new civilizations and material for a fifth player. Be careful this game is an extension of Sid Meier's Civilization: Le Jeu de Plateau and cannot be played alone. 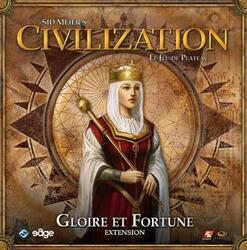 To be able to play it you must have a copy of the game Sid Meier's Civilization: Le Jeu de Plateau .